Contact us at Imaginal Labs! What is the greatest impediment preventing Americans from getting good health care? Surprisingly, it’s not the cost of care. Instead, according to new research from the Center for Talent Innovation (CTI), the fundamental issue is the health care industry’s failure to develop a nuanced understanding of, and commitment to, women as consumers and decision makers. For the full report, see the Harvard Business Review (Free registration required). Categories: Carolyn Buck Luce, Health Care, Legacy Building, Power of the Purse, SHEconomy, Thought Leadership, and Women. Tags: Carolyn Buck Luce, Center for Talent Innovation, Health Care, Thought Leadership, and Women. 2012 WOTY Carolyn Buck Luce and a panel of experts are set to discuss the impact of the SHEconomy on healthcare at this year’s HBA Annual Conference. Categories: Carolyn Buck Luce, Health Care, Pharma, Power of the Purse, SHEconomy, and Women. Tags: Carolyn Buck Luce, Center for Talent Innovation, CTI, Healthcare, Pharma, Pharmaceuticals, POP, Power of the Purse, and SHEconomy. Two weeks ago I attended WPP Stream Health in Orlando, the “unconference” hosted by Grey Healthcare and ended in San Francisco at TEDMED 2014. The theme of both gatherings was unleashing imagination and collaboration to redesign our approach to building a healthier world. I had a particular mission. As the Executive-in-Residence at the Center for Talent Innovation, I am leading a research project sponsored by leading bio-pharma, health solutions and managed care companies on “The Power of the Purse: The Implications of the SHEconomy on the Business and Talent Models in Healthcare.” Although it has been known for a while that women are estimated to make 85 percent of the health care decisions for their families and are the majority of patients, pharmacists, regulators, nurses and HC workers in the largest and fastest growing segment of most economies, these facts have not yet translated into broad ranging innovation in HC discoveries or delivery — much to the detriment of health outcomes for individuals, families, and society. Not to mention the health of the bottom line of companies. In an industry that is still predominately product and disease-centric, I was on a search to meet and understand SHE — the women behind the stats. I wanted to put a face to and a voice on the women who are under-served, under-treated, under-heard and under-supported to better understand the pathways to a healthier future. This includes the patients, their caregivers, and the healthcare professionals who serve them. The Chief Medical Officer — At WPP Stream Health, a multidisciplinary group of physicians, marketers, digital technologists, regulators, consumer advocacy groups and bio-pharma scientists, redefined Mom as the CMO of the family and reimagined the power of elevating her to a position of respect and responsibility as a key member of the medical team. After all, the CMO is the chief nutritionist, lead diagnostician, statistician, caregiver and enforcer of adherence for her family, identifying early symptoms, creating guidelines of healthy eating, monitoring compliance and encouraging adherence. Think about the opportunity to support her with respect, blockbuster tools and transparent, trusted information so that she could do her job. The Surgeon General – -At TEDMED, on Sept 11, we heard from the U.S. Army Surgeon General, Lieutenant General Patricia Horoho. While acknowledging the approximately 3000 people who lost their lives when we were attacked at Pearl Harbor and, again, on September 11th, she spoke of the 400,000 patients that die every year in US hospitals due to “preventable harm”. She called for doctors and hospital systems to become more courageous, honest and transparent about medical errors so that they can be understood, examined, measured and remediated. The Nurses — In the Hive at TEDMED, a buzzing arena filled with innovative entrepreneurs experimenting with technology that will revolutionize health, I played a Virtual Reality game of Snowmen, presented by Howard Rose, the CEO of DeepstreamVR. This game is played by burn victims coming back from Iraq and Afghanistan as a pain management intervention during the treatment of their wounds in the burn unit. Howard explained that the Doctor-centered model that exists today underutilizes our ability to heal ourselves. DeepstreamVR’s targets are the nurses, who burn out in part due to the pain they impart during the treatment. Virtual reality as a pain management device allows the nurses to experience healing as opposed to hurting. The Researchers — In the Hive at TEDMED, I met women researchers, like Rupal Patel, who were motivated to commercialize their research to answer the emotional suffering that comes from disease. Through her company, VOCALiD, Rupal is creating customized synthetic voices, not the standard issue voice that we associate with Stephen Hawking. Rupal’s technology combines sounds from “unheard” patients who are unable to speak clearly with “sound DNA” contributions from volunteers who contribute their voices to be digitally combined with the patients’. As a result, patients are able to type messages that are expressed with a unique vocal persona that engages and builds emotional connections. For all her ingenuity as an inventor and a woman entrepreneur, she is challenged in the male world of venture capital. The Doctor - We heard from Dr. Leana Wen, an emergency physician who has received death threats for her decision to launch and the Total Transparency Manifesto imploring doctors to reveal who they really are — their values, their views on end of life, sexual orientation and reproductive rights, their conflicts of interest, and other humanizing facts that could help increase the trust and confidence of their patients. The Patient – Through the inventor of an expert-system online protocol, I glimpsed into the world of women with headaches who go from doctor to doctor looking for relief and proper diagnosis without understanding that women are 3 times more likely to experience headaches due to their hormonal, kinetic and neurological makeup. And the women with heart disease who goes undiagnosed because her symptoms don’t include numbness and chest pain – making heart disease the largest killer of women in the US. Face to face with SHE. And SHE has so many faces. This is great news because by better relating and connecting to SHE, we can be on the road to recovery. Categories: Carolyn Buck Luce, Health Care, Thought Leadership, and Women. Tags: business news, Carolyn Buck Luce, Health Care, Leadership, pharmaceutical, TED, Thought Leadership, and Women. After four decades in the public and private sector, all in male-dominated industries–the Foreign Service, Investment Banking and Consulting–I think it’s time for a new approach to women’s leadership training. Instead of focusing on how to help women “catch up” and “level the playing field”, let’s help them embody the new leadership competencies and behaviors that all leaders will need in the new economy. Don’t get me wrong. Today’s current training for women professionals striving for success in a male-dominant culture focuses on constructive, necessary skills and behaviors like negotiating, finding mentors and sponsors, building executive presence, networking, and self-promotion. This approach goes hand in hand with a parallel focus by companies to tackle their talent management systems and processes in order to re-engineer unconscious bias out of decisions around hiring, promotion and work assignments. However, after hundreds of millions of dollars, pounds, and euros of leadership training, we are not moving women fast enough through the talent pipeline to senior leadership and board positions. At the Center for Talent Innovation, where I am the Executive in Residence, we know that today’s approach is 100% half right. Women need to develop all those competencies, but they are only half of what we need. Companies in all industries are facing seismic shifts in the way business is being done. Our travels through the Information Age are speeding up and we are entering the Imagination Age, fueled by technology, data, globalization and industry convergence. In fact, it’s easy to imagine that in 10 years, 25% of the job titles that currently exist globally in Healthcare, Media, Telecommunications, Financial Services, Manufacturing etc. will be gone, replaced by something new. Instead of just playing “catch up”, there is an opportunity to advance beyond the current state of play to build critical personal skills and behaviors fit for the future. Business Model Architect–experienced in knowing how to (re)organize and (re)construct the tangible and intangible assets needed to deliver the most value to others for a fair value in return. Brand Designer -able to create the optimal “user experience” that is authentic, aligned, attuned and anticipatory to all stakeholders. Digital Executive–fluent in creation, curation, synthesis, socialization and distribution of meaningful virtual content and communication that builds trust and engagement. Trust Builder–successful in building strong, trusting relationships, face-to-face and virtual, with all stakeholders across the divides of culture, gender, geography, time zones, and generations. Talent Maker–master of the inclusive leadership behaviors and practices that celebrate the power of difference in a way that encourages all streams of talent to work up to the level of their skills and aspirations in order to unlock the illusive “diversity dividend”. Ecosystem Engineer–accomplished at designing, nurturing and sustaining powerful networks that form the relational capital that drives competitive advantage. The current leadership development agenda is a good start. Now imagine the power of mastering these new Leadership Archetypes and applying them to your company’s biggest business challenges. I bet the men would want to sign up for this as well! Categories: Carolyn Buck Luce, Thought Leadership, and Women. Tags: Carolyn Buck Luce, Center for Talent Innovation, CTI, Inc., Leadership, Thought Leadership, and Women. Last week, I had the honor of being the MC for the event at the United Nations to celebrate International Women’s Day. Presented by the U.S. Chamber of Commerce Foundation and the UN Office for Partnerships, “Turning Inspiration into Action: Next Steps for the Private Sector to Empower Women Globally” convened a cross-section of social empowerment heavy hitters, including Chelsea Clinton, Ambassador Melanie Verveer, and representatives from some of America’s biggest companies who make it their business to help women succeed. Why should the private sector care? And why the UN? Today we are facing a new Emerging Market that will dwarf the size of both the population and GDPs of China and India. What is the Emerging Market that will redefine society and the world? Women. And there is a powerful business case for developing sustainable women’s economic empowerment programs, not just in the United States but also around the world. In the next decade it is estimated that close to 1 billion women, mostly in the developing world, are going to enter the formal economy and become new economic contributors, as full-time workers and micro-entrepreneurs. The growing pace of urban migration, access to education, better health, mobile technologies and micro credit will continue to fuel this phenomenon. This tidal wave of talent and new purchasing power joins the growing dominance of women in the developed world. • In the U.S. and Europe, women account for the majority of college students, and this is trending towards 60 percent. • Working women in the United States generate $4.3 trillion in earned income annually and now represent 50 percent of all workers in this country. • Women contributed nearly 100 percent of the change in family income in the past decade in the U.S.
• They represent the fastest cohort of wealth accumulators — owning 75 percent of the nation’s wealth in the U.S. — and are estimated to inherit anywhere from $12-$40 trillion over the next 20 years. • If women were working at the same rate men were global GDP would take off — for example, in Egypt, GDP could grow by 34 percent, 12 percent in the United Arab Emirates, in Japan by 9 percent, and in the United States by 5 percent. At a time when country boundaries are hardening, creating challenges for multilateral and civil society organizations to fulfill their missions, there is good news. The private sector is growing in consciousness as it goes global in a shrinking world. The demographic, social, geopolitical, technology and economic realities are coming together to paint a vivid picture in the C-Suites — and executives are realizing that women are the greatest untapped and abundant natural resources left on the planet. And courageous private sector leaders understand that we are reaching a tipping point where companies will need to take a longer-term view and embrace the possibility that the private sector could be a unique engine of transformation for the world. At the Center for Talent Innovation (CTI), www.talentinnovation.org the New York think-tank where I serve as Executive-in-Residence and co-founder, women’s empowerment has been one of our core themes since the Center was founded ten years ago, and it remains central as we move into our next decade of amplifying the conversation on under-leveraged streams of talent around the world. In fact, we are calling 2014 “The Year of the Woman” at CTI: We kicked off the year by launching “Athena Factor 2.0: Accelerating Female Talent in Science, Engineering and Technology.” We’re also producing in-depth, data-driven reports on “The Power of the Purse: The Implications of the SHEconomy for Health and Wealth” which examines the ways companies can leverage their business and talent models to capitalize on these demographic mega-trends. A subject near to my heart, we will also be launching “Women and Power,” which will illuminate how women differ from men in how they define power, what they want from it, how they “wear” it, and how their relationship with power and ambition contributes to their “stalling” at the threshold to executive positions. In a panel discussion which I moderated at the UN event, four of our sponsors of these studies — Tupperware Brands, UBS Financial Services, Cardinal Health, and Grey Healthcare Group — had a thought-provoking conversation on the “SHEconomy” and the power of the female consumer in a growing middle class to effect change in all different sectors of the economy. It’s a conversation that will spread to every corner office, cubicle and kitchen where a talented women is making decisions about how to invest her money, pay for her — and her family’s — healthcare, and progress in her career. I hope you’ll join in. I’d love to hear your comments. Tags: business news, Carolyn Buck Luce, Health Care, United Nations, and Women. Companies that engage, develop, and promote female talent are more likely to capture a new market and to improve market share. Ten years ago, when companies were talking about capturing the next 1 billion customers, they were referring to participating in the emerging markets of Brazil, Russia, India, and China (BRIC). And that prospect was open to only the largest and well-resourced global companies that had mastered the art of global expansion. Today, the biggest emerging market is much closer to home–whether home for you is the U.S., Europe, China, or elsewhere. Women are the largest and fastest growing segment of purchasers and investors in the economy — any economy. Women are the big spenders and are getting wealthy fast. The numbers are staggering. In the U.S. (with similar directional numbers in Europe), women account for the vast majority of all consumer purchases–65 percent of new car purchases, 85 percent of healthcare expenditures, and 91 percent of new homes purchased. They represent the fastest cohort of wealth accumulators–owning 75 percent of the nation’s wealth in the U.S.–and are estimated to inherit anywhere from $12 to $40 trillion over the next 20 years. U.S. women are also now the majority in the workforce. Close to 1 billion women are estimated to enter the workforce and marketplace in the next several decades in the developing world. These seismic economic and demographic shifts are referred to as the “SHEconomy” and illustrate the “Power of the Purse” of women as decision makers and influencers in many segments of the economy. The power of this market is astonishing yet women continue to be relatively under-invested in by large companies. Research shows that women feel misunderstood, underserved, underestimated, and undervalued by companies across industries. Women are highly influential in financial services and healthcare decisions. I serve as Executive-in-Residence at the Center for Talent Innovation (CTI), and we’re conducting research on the Power of the Purse in financial services and in healthcare, two sectors where women are highly influential if not dominant in the wealth and health decisions for their families. We find that in each of these sectors, women feel misunderstood (84 percent by investment advisers and 66 percent by healthcare marketers) and underserved. There is a huge opportunity for companies, large and small, to align their business and talent strategies to fully take advantage of the implications of the SHEconomy. Companies are learning that successful strategies go way beyond coloring the product pink. A winning strategy requires deep market insights into the users’ desired experiences and their customer and behavioral preferences. There are lessons that can be learned from companies that, over the last 10 years, have successfully captured the BRIC emerging markets. Instead of “exporting” their traditional business models and products, these companies modified both their business and talent strategies to fit the new market–by hiring local talent to lead, designing for local tastes and budgets, and adjusting for shopping preferences. Gender-diverse teams are making headway. The great news of the SHEconomy is that companies have much of the talent they need in-house or close to home. The business model and mind shift that is required is to move from product-centric design and development to customer-centric design that factors in the user experience and unmet needs. And the goal of the shift in the talent strategy is to unleash the power, ambition, and insights of these gender-diverse teams. Our recent (CTI) report, “Innovation, Diversity and Market Growth,” illuminated that companies with greater aptitude for fully engaging, developing and promoting their female and diverse talent are more likely to capture a new market and improve market share. In short, these companies will better understand and connect to what women want and value in the marketplace. The silver lining in the Power of the Purse is that it provides companies with a clear path to modify their product-centric business models and “traditional” talent strategies to capture their fair share of the SHEconomy. At a time when the majority of college graduates are women in many countries and more than $20 trillion annually is spent from the purse controlled by women, the opportunities for nimble, customer-focused companies are exponential. Tags: Carolyn Buck Luce, Inc., Thought Leadership, and Women. Download the PDF slide deck at right to the talk given this year at Annual Meeting of the SFO chapter of the HBA on October 24th, 2013. It’s a large file (17MB) so it might take a moment. Carolyn Buck Luce spoke at the Annual Meeting of the SFO chapter of the HBA on October 24th, 2013 at the HQ of Onyx Pharmaceuticals. She shared her vision for the future of the HC industry and the new competencies that leaders will need to drive the transformation that is upon us. Tags: Carolyn Buck Luce, Health Care, ten year plan, Thought Leadership, and Women. For what purpose? This is the “now” question for the women’s movement. Let me explain. My mother, who is 85, was one of only two women in her law school class at the University of Chicago in the ’40s and, for her generation, their fight was to prove that women could do it. For my generation of baby boomer women who came into the workforce in the ’70s after elbowing our way through male-dominated graduate schools, our mission was (and still is) to get the numbers up, to fill the talent pipeline with women who have a chance of breaking the glass ceiling. I recently wrote about “Women and Power,” the class I teach at Columbia University’s Graduate School of International and Public Affairs (see my HuffPost blog “Finding the Leader Within“). My graduate students have a term paper due this week where they must declare their purpose — Why they are on the planet? — as well as prepare a Power Plan on how they are going to acquire power, claim ambition and use that power/ambition intentionally to make progress on their purpose. Two weeks ago, the topic was “Leadership in the 21st Century.” For that class, I “imported” three courageous women leaders whom I had the privilege to meet and work with this past summer in the Amazonian rain forest in Ecuador as part of my commitment to the Pachamama Alliance. The Pachamama Alliance is devoted to partnering with the indigenous nations of the Amazon basin to preserve the biological and cultural diversity of the rain forest as well as educating the “modern world” on the importance of creating an economically sustainable, spiritually fulfilling and socially just human presence on our planet. 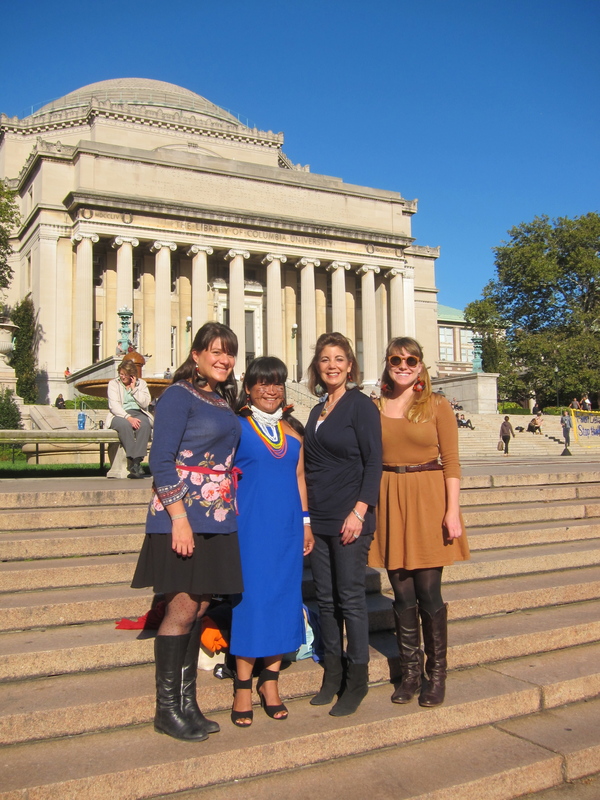 Belen Paez, a native Ecuadorian from the Andes, is the President of the South American affiliate, Fundacion Pachamama. 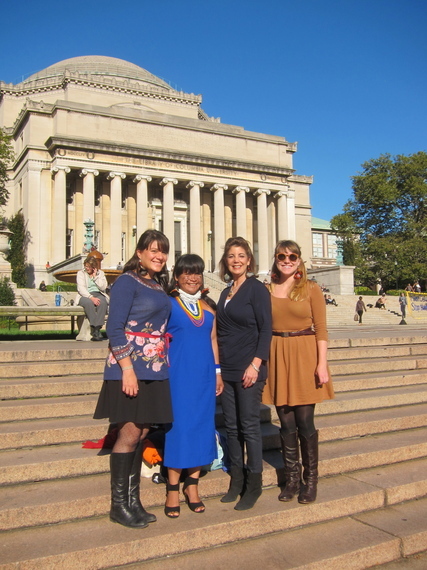 She joined me in NY along with Narcisa Machienta, an indigenous leader from the Achuar Nation and her American-born colleague, Robin Fink, an anthropologist. These three women held my class spellbound as they told their stories. Belen, educated as a biologist in aquatic animals, shared her commitment to protecting the life of the forest at all costs. This purpose became her life’s work as she worked to protect the pink dolphins and giant otters that are now endangered species in the Amazon. Narcisa, a native-born Schuar woman married to an Achuar man, retold how, upon moving to Achuar territory, she was shocked at witnessing difficult and some times fatal effects of traditional birthing and pre/post natal care on the women, children and native communities. Although in a very male-dominated “machismo” culture, Narcisa found her purpose by insisting, first to her husband and then in front of 500 men leaders, that it was both possible and imperative to educate the women on midwifery and maternal/child health practices that could co-exist with their traditions. She was able to gain the support of the shamans, the elders and the male leaders by helping them understand that protecting women and children was a critical part of keeping their communities and the entire Achuar Nation healthy and vital. The result was the birth of the “Jungle Mamas” program of Pachamama Alliance. Robin, a young American-born anthropologist who is the Program Director for Jungle Mamas, spoke passionately of her work with Narcisa in the Achuar communities. Without taking care of maternal and child health in indigenous communities, the work of forest conservation and protection of biodiversity will falter. The Amazonian rain forests are the lungs of the world. If the rain forests are not vigorous and healthy, we are all at risk. These three women — Belen, Narcisa and Robin — are great examples of courageous leaders who help answer the question, “For what purpose do we need more women in leadership?” Strong, passionate, fierce women — along with men as allies — will be the face of leadership we need in the 21st century as we marry our current work to the traditions and wisdom of the ages. Together, we can lead our companies and institutions to serve the needs of society today and for successive generations to come. This post is part of a series produced by The Huffington Post in conjunction with our women’s conference, “The Third Metric: Redefining Success Beyond Money & Power,” which took place in New York on June 6, 2013. To read all of the posts in the series and learn more about the conference, click here. Join the conversation on Twitter #ThirdMetric. Categories: Carolyn Buck Luce, Thought Leadership, Uncategorized, and Women. Tags: Carolyn Buck Luce, global talent, Pachamama Alliance, Thought Leadership, and Women. See the entire interview with Nancy Redd on the Huffington Post LIVE channel and read Carolyn’s essay on Women and Power: Finding the Leader Within at HuffPo too. Tags: Carolyn Buck Luce, Huffington Post, Thought Leadership, and Women. Is there a Doctor in my Phone? Welcome to the reality and the promise of telehealthcare where the Doctor’s Office is the Mainframe of the Decade. I recently key noted at the inaugural Telehealthcare Leaders Forum held in Newport, RI and sponsored by Tunstall America, a leading global creator of telehealth solutions. The footprint of telehealthcare continues to expand because of the exponential impact of Big Data, the Internet of Things, smartphone utilization, the super consumers’ demand for better and faster healthcare insight and service, the forecasted shortage of doctors and the incredible pressure felt by individuals, payers, providers and governments to contain HC costs. Think about this – -I would venture to say that there has never been so much pent up demand for improvements in any system by Main Street, Wall Street and Washington then currently exists to improve the entire HC system – – how HC is produced, delivered, consumed and paid for. And the technology is already in place, at our fingertips, to make a substantial and transformational change. There is not a panacea for change because systems evolve organically based on multiple factors and we know from the decades long battles over health care legislation that money, politics and policies are a three-dimensional chess game and the pricing incentives that help make markets honest will be a long time coming. However, as pointed out by another keynoter at the Forum, Dr. Jason Hwang the co-author with Dr. Clay Christianson of “The Innovators Prescription”, the price of computing did not require legislation to drive disruptive innovation of the mainframe business. HC savvy consumers, who have learned how to use technology to make their lives easier by bringing the expertise to them through digital innovations- – fast, reliable, dependable, assessable and affordable with online on demand banking, shopping, learning, computing, publishing. etc. Company behavior, otherwise know as a Business Model, as traditional and non-traditional companies are experimenting with the components of telehealth to finally be in the patient outcomes business, instead of the product and device business. Leadership behavior as more professionals and executives recognize that it is a personal (and corporate) competitive advantage to become digitally fluent in order to enhance the way they lead, manage, communicate and innovate. This will be a great win for patients, companies and society. Categories: Carolyn Buck Luce and Health Care. Tags: Carolyn Buck Luce, Health Care, and Thought Leadership. Sign-up for our mailing list - keep up-to-date with Imaginal Labs!